But, I was thinking about what to write today, and the other day I became sort of “aware” of another character type, which I find very interesting. It’s the character who by all accounts should be unlikable, and yet is totally likable! I became aware of this whilst watching The Many Adventures of Winnie-the-Pooh. This is a fantastic film, and it comes from a fantastic series of stories. And one of the best (in my and my husband’s opinion) characters in this series is Eeyore, the most depressed creature probably ever in a children’s series! Seriously. If Eeyore actually existed, then, aside from being dreadfully concerned about his mental well-being, he’d probably get very annoying after awhile. You’d try to avoid him, or get angry and yell at him to lighten up. And yet, the more pathetic and depressed Eeyore is in this series, the more lovable he is, too! This is a clip from the new Pooh movie, but it also highlights Eeyore’s self-image issues. I suspect this strange likableness of horribly depressed and downtrodden characters also extends to characters like Marvin in A Hitchhiker’s Guide to the Galaxy, but I’ve only seen the movie so I’m not qualified to say for certain. And I think this idea extends in many ways. Super evil characters, for instance, can be quite enjoyable. 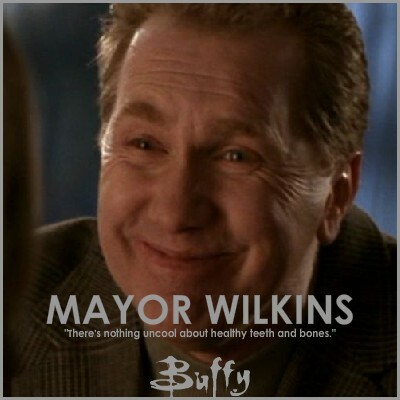 As can evil characters with quirks, like The Mayor from season three of Buffy the Vampire Slayer. This is a crazy evil non-human thing, that is obsessed with good manners, old fashioned values, and hates germs. Now, aside from the fact that he’s, you know, evil, I think his reprimanding the use of bad language, and his instance on keeping feet off the furniture, would get annoying really fast. But as a character, he’s actually a lot of fun to watch! I think we can like these kinds of characters because we see them through the veil of fiction. We worry a lot in life, and we worry a lot in fiction, too. Sometimes, we just need to be able to let go of that worry. We don’t have to be concerned for Eeyore because we know he’ll be okay in the Hundred Acre Wood. We don’t have to get annoyed by The Mayor because we’re not the ones subjected to his evil plans or annoying manners. The burden of morality is off us, and we can enjoy characters that in another realm would be vastly annoying, disconcerting, or just plain scary. I don’t think I’ve ever really written a character like this, someone who should be very unlikable and yet finds a place in the hearts of readers anyways. But I’d love to. I am a huge fan of complex characters, and I think this character type fits perfectly into that category. It’s definitely something I will keep in mind in my future writing. So, have any favourite unlikable likable characters? I think downtrodden or "evil" characters, when not the main character, can serve as comic relief or be endearing in a similar way. If they're the main character, though, things get more complicated. Aw! I always like Eeyore more than the Pooh. I think making evil characters which people still somehow like is an art in itself. Not an easy thing to do. Ah, the likable evil character… Given my WIP, I'm really hoping I can pull that off. You're right, though, that it's usually easier to like unlikable people when you don't have to deal with them in person. Even that single step between my outward reality and the character party inside my head can make a lot of difference.